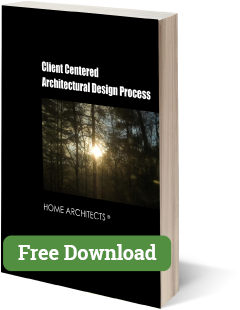 Why Architecture Takes So Long to Create is about this architectural firm’s explanation to the world of Clients regarding the time Architects take to produce their designs and documentation for those designs so that Contractors can build them. (C)Copyright 2019, Home Architect, PLLC. Project nearing conclusion, before paving and final paint on left wall. Okay, so you’ve hired an Architect and he/she/they seem to be dragging their feet and taking an awful long time to produce first: your design, and second: the CDs (Construction Documents) that illustrate to the Building Department and your Contractor how that design is supposed to be built. 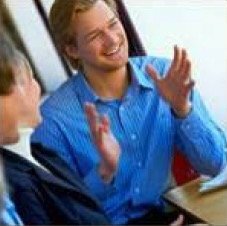 Hey, from your perspective (the Client), you’ve already paid your Architect a ton of money and they already “drew-up” the floor plan you wanted, so doesn’t that mean they are close to being done? The “plan” is drawn, so what’s the big deal? Nope. Guess again. The floor plan(s) are often less than 5% of the entire architectural effort. There are also Elevations, Building Sections, Wall Sections, blow-up section and plan details, specifications, door information, finish schedule, Roof Plans, Cabinetry, Electrical, 3D imagery and more. Rather, they may indicate that they are preparing Record Drawings that have been based off of paper drawings, which may or may not have any field verification, which often is left to the Builder to verify, mainly because the Client usually doesn’t want to pay the Architect to go out to the project site many times to actually measure existing conditions. Okay, getting off on a tangent there. So we’ve established that an Architect WILL charge More, not less to do a renovation/addition on a relative percentage basis, even though they may charge by the hour. So let’s get back to the subject of Architects and why it takes so long to produce the design and documentation for your project (assuming you are a Client of an Architect). that often lasts several days and for which there is a high fail rate and then apply for and prove to at least one State that they are worthy to be trusted to design, document and administer architectural design and construction projects involving life and limb of other humans, to whom their well-being is entrusted, then to be thrust into the real world, earning a living for decades, proving themselves over and over again, earning additional certifications and licenses, taking yearly CEUs (Continuing Education Units), solving thousands of problems, honing themselves to be one of the best problem solving people on the planet, all fine-tuned and ready to serve your wishes. Whew. That’s quite a lot of preparation, isn’t it? All so that you can tell them how large you want your new Master Suite. What an enormous amount of horsepower to bring to bear on your needs. VALUE OF CONSTRUCTION & PERCENTAGES: Once again: this effort ultimately amounts to time. And the Value of the construction. What does the cost of construction have to do with anything if an Architect is mainly selling their expertise and time? Well, it has long been understood in the design and construction world that there is a corresponding amount of design and documentation effort associated with the construction cost of a project. Why? Because a $1million house will ALWAYS be more involved and larger and take more time for an Architect to program, design and document it than a $100,000 house. Roughly 9x more effort on the larger budget house. Makes sense, right? Because that’s real. So how does that work, then? How to evaluate a proper Architectural fee for either a small, simple house or a large, complex project? Hmmm. Well, it so happens that the Architectural world out there KNOWS what the approximate percentages should be, in terms of rules of thumb. And also, nearly any Architect who has been working for over 10 to 20 years knows these rules of thumb as well. No architectural organization that represents the interests of Architect is allowed (in the USA) to publish such rules of thumb. The Government doesn’t like that. However, no one cares if any company, Architectural or otherwise, or individual, Architect or otherwise Can publish these rules of thumb. No harm, no foul. One such Architect from another firm (we believe, from Canada) has performed her own personal in-depth research all over the world, including the USA, and has published these rules of thumb. They are mainly based on percentages of the cost of construction. 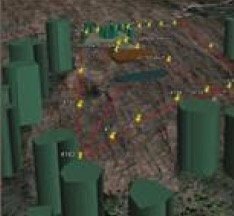 She published her findings in a third-party Public Information website called: ArchitecturalFees.com . Check it out. But that’s really not the purpose of this online article here. Rather, we’re trying to explain why it takes so much time to produce a work of Architecture, for a house, or any other project, for that matter. Let’s look at this issue from another angle. Our Senior Staff Architect just moved into his new house for his family in North Carolina, USA. By most standards, it is a fairly modest effort, with only 2,188 HSF (Heated Square Feet) and 3,818 GSF (Gross SF including garage and porches). This project had a great deal of Value Engineering to keep things as simple and cost-effective as possible. Most of the interior is drywall, with a few timber posts and beams and wood stair. The outside is 70% metal siding, with some cementitious horizontal lap siding and front and rear timber posts. Some minor amounts of rock inside and outside. Metal roof. Vinyl windows. Comparing with many mountain houses, this is a simpler project. NUMBER OF LINES AND OBJECTS IN THE DRAWING FILE(s): The Architect just audited the AutoCad drawing file for this project and it indicated that it checked 1,297,851 lines or objects. If that is the entire amount of lines and objects in the main drawing file, then the Architect had to evaluate and think about all of those lines and objects in one way or the other. If you could count to 1,297,851 and your could verbally state 4 numbers each second, it would take you 324,462 seconds just to count to the number of objects the Architect had to deal with during the creation of his design and documentation (at least those within the AutoCad file, which does NOT include his time involved in being on-site, dealing with Contractors and workers, the Building Department, his family, selecting and purchasing decisions for hundreds of items and more). That’s 5,407 minutes. That’s 90.1 hours. Which is more than 2 normal work weeks, just to Count the number of objects involved in the Architect’s work for a single detached custom home. Now, if you had to think, perhaps for a minute, just 60 seconds for each line involved, that would = 77,871,060 seconds. Divided by 60 = 1,297,851 minutes, divided by 60 = 21,630 hours divided by a normal 40 hour week = 540.7 weeks divided by 52= 10.39 years of thinking for this one modest project. Now then, if we say that perhaps half to 2/3 of the lines and objects were imported from other projects and reused and that decisions and reuse of these lines and object was much faster, perhaps applying a 67% factor, about 3.1 years of normal 40 hour a week actual time was involved. And it did in fact take the Architect 4.5 years from the time he bought the land until he built his house. So that may be a valid correlation. NUMBER OF DRAWINGS: How about the number of drawings and specification sheets an Architect needs to produce for a project? Well, for this particular Architect, he created 38 sheets of 24″ x 36″ drawing sheets. This Architect used to work at a firm in downtown Orlando, at a time when drawings were hand-drawn. The Principal Architect in charge of Production there said that each drawing was worth from $2,400 to $4,000 each, in terms of manpower (person-power). 38 sheets x $2,400 = $91,200. 38 x $4,000= $152,000. If you divide by the Architect’s hourly rate of $125/hour, that would = 729.6 to 1,216 hours, which is probably about what the Architect did on this particular project, with all the daily time spent on it, including in person on-site visits for months at a time during the construction. HOURLY RATE INTO NORMAL RULE OF THUMB %: Let’s look at another method of time/project value. That website for architectural fees indicates roughly 10% for basic services for a new project (like a house) and 15%+/- for a renovation. So, if the cost of this Architect’s house was around $655,000 with the land and the land was $135,000 then the cost of the house and related improvements is around $520,000. Since this is a new house and IF the Architect’s services only included Basic Services (which doesn’t include many, many other things that he actually did do) that might be around 10%. 10% x $520,000 = $52,000. That’s probably a good ballpark for a simple fee and now if the Architect’s hourly rate is $125, let’s divide that into the ballpark fee for an estimate of hours (just of Basic Services) = $52,000/$125 = 416 hours. If the Architect works on this project 40 hours a week, that would involve about 10.4 weeks or about 2-1/2 months. Understand: Basic Services doesn’t involve many services many people take for granted. Like electrical plans, bidding/pricing with Builders, documentation of existing conditions (for renovation), Construction Administration (site visits and many other activities during construction), cabinetry elevations, and many other things, including project management, interior design, etc. Meaning that this would be a very spartan amount of time and fee for this Architect on this project. Most projects would likely be double that amount of time, or perhaps 5 months or more. So: for even a small, new simple house, expect at least 2.5 to 5 months. That should be fairly normal. CHANGES: No Client in the world thinks that the time involved with the Architect making their requested changes affects anything, including the amount of time the Architect needs to produce the drawings and specifications for their project. IT DOES. Everything takes time, nothing is as simple as it seems and TIME is the result. DRAWING SESSIONS: The Architect checked the number drawings sessions on this project file. There were 457. He said he routinely manually saves about every 2 hours or so, meaning there may have been 914 actual drawing hours involved for him on this project. 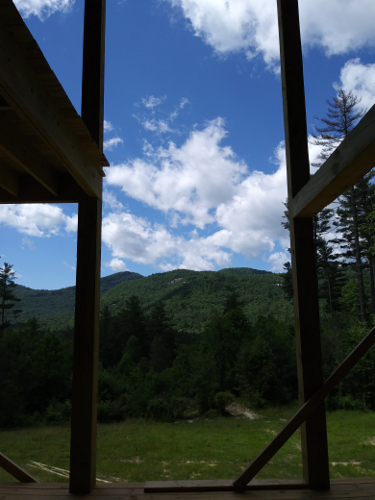 Cost to Build Mountain Houses 2019 is about how an Architect of custom mountain houses just completed a new house in the mountains for his own family and the costs involved with that. Almost new every Client this Architect has believes (for no good reason) that they are going to be able to get their new house constructed for around $100 per square foot. And even worse: Per HSF (Heated Square Foot) which they think includes a large garage for multiple vehicles, generous rear and front porches, timber framing and plenty of goodies. Reality check: That ain’t gonna happen. Why: because the Architect knows, through personal experience, that even managing the construction directly and personally for his own house for 9 months, and value engineering every aspect to save on the cash invested, it is just about impossible to build a custom mountain house for less than around $225/HSF (within himself running the entire operation) and more realistically, closer to $275 to $300/HSF with a General Contractor. Why: that’s what it costs in mountainous regions to build. Kind of like asking why the sky is blue and if you can change that. It really doesn’t matter what the reasons are, it just is. And do you really think that because you are a graphic designer, or housewife, school teacher, or a high-powered executive, that you’re going to be able to change that reality? Or be able to make some genius drawings (that your Architect with over a half-century of experience can’t)? Don’t count on it. Many have tried, none have succeeded. There’s a lot more to architectural documents than just floor plans. And costs are costs. You don’t get stuff for free. Especially from busy builders in the mountains. But you may want to learn something about these costs. This particular Architect knows every penny of the costs involved with his own house and many of those for his Clients. For instance: can’t you really get the cost for a mountain house down to under $275/HSF? Yes you can. But, the question is: do you really want such a house? — Electrical minimums: no outlets where you want them. Minimal power box amps. — Not many, if any built in light fixtures. Mainly switched outlets for your lamps. — Cheap windows that leak energy and not many windows and those that are provided are small. — Minimum insulation levels that leak energy to code minimums. — Cheap plumbing with no water purification filtering (code shorten your life). — Little to no sitework: you may have a hard time moving your vehicles around and/or parking. — The above item also means that your land better be almost dead level, because you’re not going to be able to afford the complicated foundations that go along with steep land. — Plastic wall siding outside that screams “cheap”. The point being: do you really want a cheap house like that for the mountains? Kind of ruins the whole idea, doesn’t it? 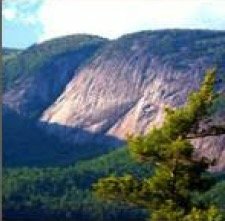 Call 3 different Plumbers phone numbers in the Cashiers, NC area and leave messages for them to call you (because they’re not going to answer your phone call), and then wait for them to return your call. That’s probably not going to happen. Why? Because they have too much work to do for rich people who pay them a lot of money and they really don’t care who you are or what you need. Sad, but true. 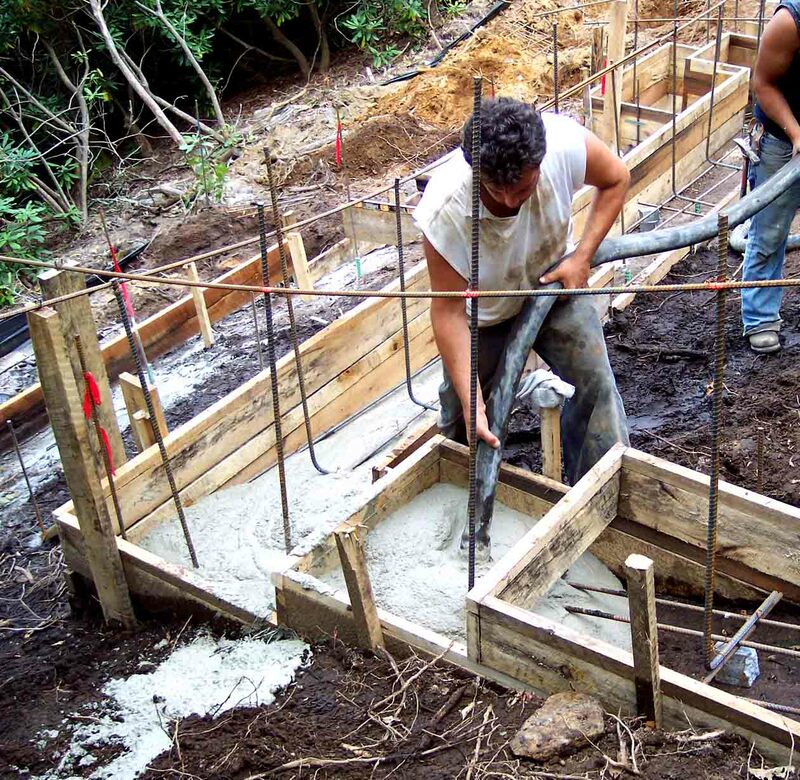 Not enough skilled Plumbers, HVAC, Electricians, Carpenters, Concrete pros to go around in the mountains. That’s the reality. They don’t care who you are or how angry you get. They just ignore you. So if you think you’re going to get people like this working on your job while you’re somewhere else, forget it. Unless you’ve got a professional here managing your job every day, who know these local tradesmen. This ain’t Jacksonville or Cleveland. The subcontractors here don’t really want your work; they have too much to handle already. So threatening them to not give them your business makes them laugh. Having said all this and popped your low-budget balloon, you really need to be planning on $300/HSF and up. Let’s be clear on what “HSF” means: as in per “Heated Square Foot.” HSF cost generally includes whatever GSF items there are (Gross Square Feet), like porches, garages, decks and the like. This means, for instance, if the interior, heated space = 2,000 HSF, the cost per HSF generally is understood to include the cost of the 3,000 GSF project. So when there are a lot of additional goodies in the GSF, like garage, porches, exterior stairs, etc., the cost/HSF skyrockets. So instead of paying $175/HSF for a bare bones house with no garage and no porches, when those items are added to the project, the cost could easily become over $300/HSF. However, you must understand that when you get below the ranges of cost indicated in this article, there likely will not be any such additional items. Those aren’t free. And before you think it or say it: no: basements are NOT free and they’re not cheap. Forget that. And neither are bonus rooms over garages: those can easily add another $100,000 or more to the cost of just the garage. You have to pay for those, and no, you won’t be able to finish them yourself, because that’s demanding, hard, heavy work that you probably can’t handle by yourself, and you’re going to need a licensed Plumber, Electrician and HVAC subcontractor. This has been Tough Love 101 Mountain House Construction Costs. 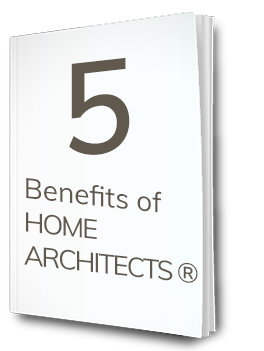 Contact the Home Architects if you want to understand what to do. They can help. Yeah, so with all this gloom and doom about costs, what do the Home Architects do? Well, for one, they program and design your house. And that’s huge. They are a licensed Architect firm. 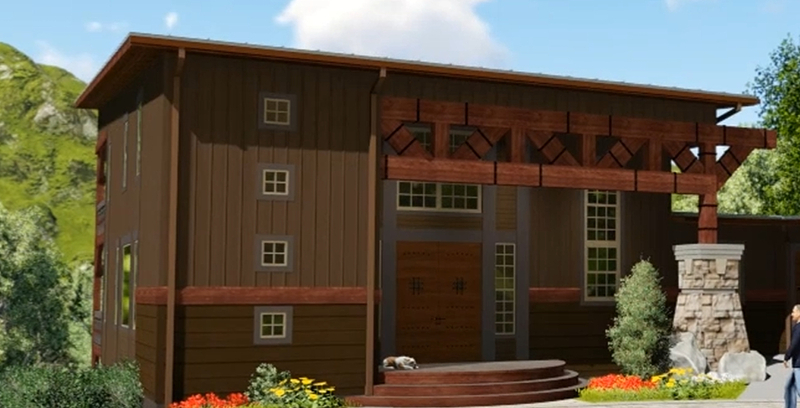 Wouldn’t you like to have your mountain house designed to comfortably accommodate your desired Lifestyle and your Land? For instance: taking advantage of those spectacular views? 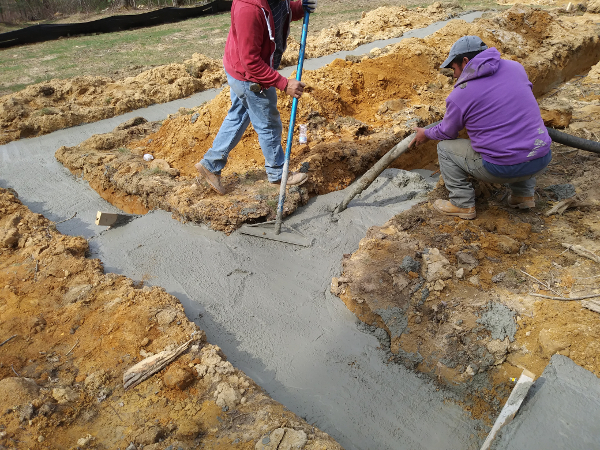 And they can solicit Contractors they know and many of whom know and trust them, so perhaps you might have a better chance of getting people to work on your job, and they can help you during construction by administering the construction. They can go to the jobsite, if you pay them to do so, to check on the work in progress, and provide written PDF reports with digital photos, updating you on the progress of your new house construction. Something you are probably not qualified to do, or won’t be in a position to do, if you’re from out of town. They can also help you make a decision of what property to buy, before you pay for it, to help you save on your sitework costs. And they can help you value engineer your project to help control costs (which are already very high). And they can perform other services to help you get your mountain house project to become a reality. That’s a lot. Give them a call. Thermal Wall Sheathing is insulation typically installed outboard of the Structural Wall Sheathing on some newer projects. This Architect firm is using it on its latest custom houses. Structural sheathing is normally OSB (Oriented Strand Board) or plywood. Structural Wall Sheathing is good practice and highly desirable: it braces wall stud framing together and unites walls with floor rim boards and roof side framing. It also is a nail base for fasteners that mount cladding (siding of many types). Also, the Structural Wall Sheathing is a nail base for the fasteners holding Thermal Wall Sheathing to the wall, and/ or any other systems requiring attachment to the wall. Because: nails through cladding don’t always end up centered in studs. Better to have wood sheathing there. And the sheathing is just one more barrier to help keep out air (infiltration) and water. HOME ARCHITECTS ® prefers ringshank nails rather than smooth shank nails to secure the Structural Wall Sheathing to the exterior face of wall studs. Why: ringshank nails cannot back out. If you try to pull one out with a nail remover (like a small crowbar), you pull the head off the nail and the nail shaft will remain. This means ringshank nails can’t pop. Nail pop is where smooth shank nails lose their grip in the material in which they where embedded and begin to back out. You don’t want that. So, what is Thernal Wall Insulation? We’re using a GAF Polyiso with foil backing. This means polyisocyanurate. It has an R value of around 6.1. There are other types, such as Styrofoam (Dow), which is blue, and nearly identical XPS (Owens Corning), which is pink. These have an R5. All Thermal Wall Sheathing in this article are rigid foam panels 1″ x 48″ x 96″. This Architect likes T&G (Tongue and Groove), but as of today’s date, only the Dow and Owens Corning appear to offer that option. 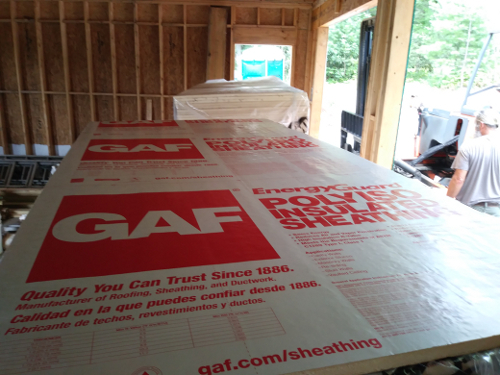 And only the Polyiso panels offer a foil backing (GAF, Johns Manville), as far as this firm is aware. Shrinkage and Contraction: Building Science Corp. States what should be obvious: all building materials contract and expand based on the temperature around them. That’s normal. The panels may expand 1% to 2%. If we accept 1%, then that means these panels could shrink and expand 1/2″ (horizontally) to 1″ (vertically), if the panels were initially installed at the midpoint of the temperature cycle. This means that the T&G feature may turn out to be useless (unless all of the panels shrink and expand with each other (for which one could make a good logical case). And it becomes crucial to have installers use a chemically compatible flashing tape at the horizontal joints as Z flashing, starting over the face at the top of the panels (at the top of each course), over the top of the panels, then up the Structural Wall Sheathing. If everything stays in place, the idea is that this Z flashing prevents water that comes into the wall from penetrating further past the Thermal Wall Sheathing (at the top and bottom). If the panels shrink or expand, the idea and hope is that the flexible and sticky Z flashing remains in place, doing its job. At vertical joints, on one particular project, the Architect is using foil tape vertically over the face of the panels. Once again, the idea and hope is that if the panels shrink or expand, the tape will remain in place, keeping water out of the joints. Now then, there may be some thought about whether or not the applied tapes will stay adhered to the foil backed polyiso panels. Good question. But it isn’t as if the tape is staying warm when the polyiso is cold, and vice versa. In other words, the tape should be subject to the same shrinkage and contraction that the polyiso panels are experiencing. So, it makes sense that the tape, whether the adhesive remains bonded to the panels or not, will likely remain in a position of water resistivity. For instance, some builders might just use a few inch ribbon of polyethylene as the Z flashing, with no adhesive backing whatsoever. And it will still shed water. So, the added feature of high quality flashing tapes like ZipTape and foil tape should simply be added insurance over that homespun solution. The above is a logical evolution of the old-fashioned WRB (Water Resistive Barrier) nailed over the wood sheathing. And the oldest is 15# asphaltic felt over the wood sheathing. There’s really nothing wrong with that. Asphalt impregnated felt works well. And after that, came TyVek, which this Architect is not fond of: it can trap water behind it and doesn’t really seal much where nails and screws penetrate it. But neither one of those incorporates CI (Continuous Insulation), which the exterior Thermal Wall Insulation does. And this offers a distinct advantage over previous systems: better wall insulation, along with the water resistive barrier, which is also an air barrier (when taped). The house becomes much tighter than ever before. But then again, this latest combination of thermal insulation rigid foam panels with foil backing is water resistive (<1% water absorption), but doesn’t allow the wall to breathe /dry to the outside (because the perm rate is <0.3. And that may not necessarily be an issue: as long as the interior of the wall system lets construction moisture to dry inward, there should be no problem. Just never use polyethylene as the interior vapor barrier over the interior side of the studs. 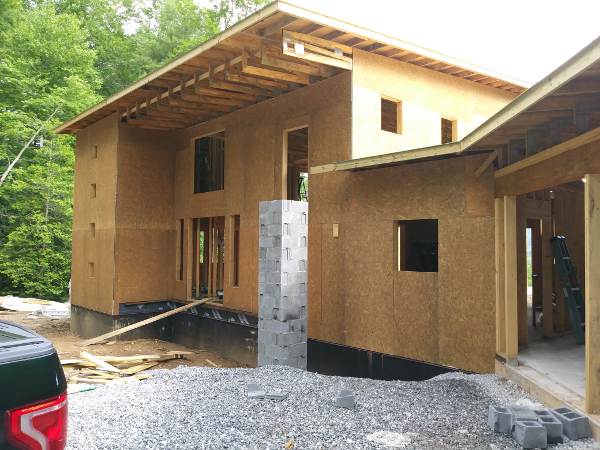 BOTTOM LINE: this new system of continuous rigid foam polyiso with foil backing and taped joints (including Z flashing at head joints) is probably one of the most effective wall sheathing systems at the present, when overlaying standard OSB wall sheathing. The foam panels should be installed vertically (so there are fewer Z flashing head joints) and all of the thermal wall panel joints should be offset from the wall sheathing joints (never on top of each other). This will aide both in air blocking and water penetration resistance. If this is all done properly, utility bills should be lower and comfort higher. If you’ve been paying attention you’re probably understanding this is all very technical and very important. Contact an Architect that knows what’s he’s talking about. Shaving hundreds or thousands of dollars a year off your utility bills might come in handy, along with keeping water out of your walls. We Don’t Need No Stinkin’ Architects is about how some people THINK they don’t need an Architect designing their house, UNTIL later, they pay a much greater price for problems down the road. (C)Copyright 2004, Home Architect, PLLC, All Rights Reserved Worldwide. Don’t kid yourself: construction of a house or any other building type, is a very complicated undertaking. Construction is very heavy and consists of thousands of components connecting together. And without the guidance of an Architect and the Architect’s documents, these components can be very different than what the owner of the house imagined, including how they are assembled. Do you really think, that without architectural documents (specifications and working drawings), you’re going to get everything in your new house to somehow magically fit together perfectly and be of the best quality? Think again. Builders are Not in business to give away things for free. Like higher quality components for which they did not price, when you were after their lower quote? Or larger windows? Or better insulation? Or better design that orients on the best views? They will Not give those to you later because they are “nice guys”. Nice has nothing to do with it. They have families to support, along with those of their subcontractors. Builders don’t research anything for you, normally. They build and install the things your documents indicate. Period. Architects, on the other hand, Do research and try to get the best items to meet your goals, for a reasonable value, and work hard to design a floor plan, building section and elevations that incorporate and respond to your site views, your desired lifestyle and appearance. That is not reality. Contractors do not just “start building and seen what happens.” They have to build from approved documents submitted to the local Building Department. And not just any documents will work well for your desired Lifestyle and your Land, and budget. What HOME ARCHITECTS calls the “2 Ls”. This takes a great deal of thought, effort and design skill. And yes, you have to pay your Architect to create these documents for you. People routinely pay their Real Estate Broker 10% for land buy/sell, 6% for home buy/sell. So what’s the big deal paying an Architect 8% to 10% for their much more involved work to design the house? Seems like a bargain. And this website: www.ArchitecturalFees.com is a public information website that provides good information about this subject. Check it out. When you have an Architect design your project, you get a much better design: one that works well for your land (slope, geology, views, privacy, vehicular maneuvering) and your Lifestyle is considered in the creation of the floor plans and other features to insure that the house is going to fit you and your family like a glove. Monster Timber Truss is about this Architect’s large timber truss supporting the front half of the the house he has under construction. This very large timber truss was custom designed by the Architectural firm: HOME ARCHITECTS ®. It was fairly economical, creating this award-winning design feature, using smaller pressure treated timber members, and combining them together to form the large bottom chord, top chord and vertical and diagonal struts. Also, creative use was made of economical special steel long screws to hold the majority of the assembly together, along with some galvanized threaded rod and conventional bolts. It spans approximately 24′ and has some members almost 30′ long in its assembled components. The above image will be updated with some others as the fabrication continues and is complete soon. The Architecture firm enjoys designing features like this, to call attention to something unique and eye-catching on an otherwise laid-back and simple design. This is the “logo element”, according to the Senior Staff Architect on the project. This is intended to draw the eye and wow visitors with its Rambo-like muscularity in an otherwise peaceful composition. This is part of the skill of this firm and one of the reasons this project won an international residential design award recently: knowing where to economize and simplify and where to have a little bit of interest to spice up the composition. 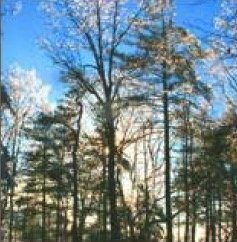 This project is being construction for a construction cost about 67% of most projects in this part of the WNC mountains, a budgetary & design feat that required rigorous Value Engineering. The CGI image above illustrates what the completed assembly will look like. 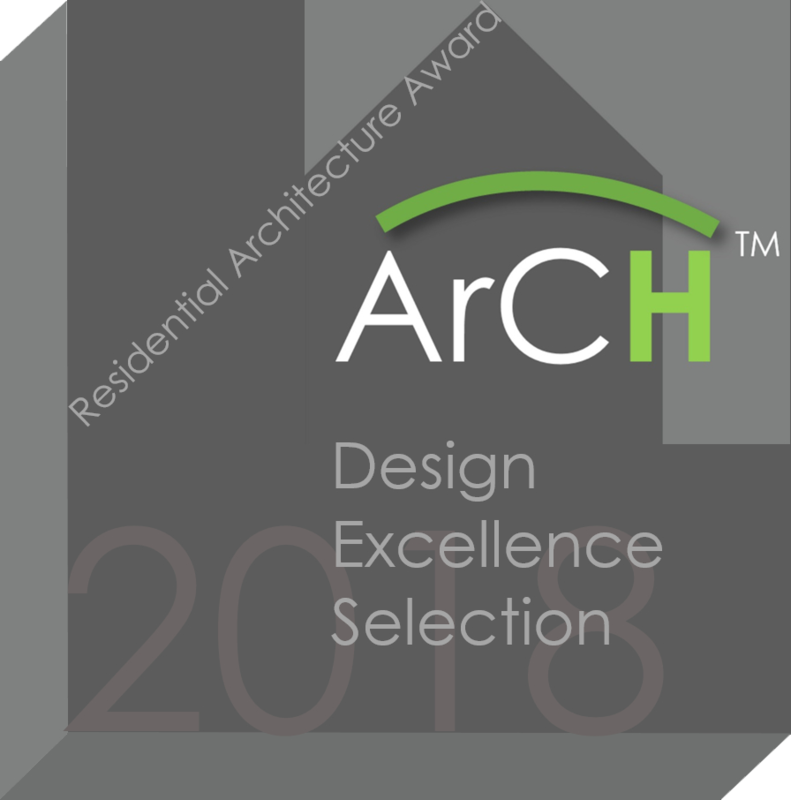 Below: the 2018 ArCHdes Residential Architectural Award for excellence from the global organization ArCH (Architects Creating Homes), received for the design of this project. Architect Designs Value into Houses is about how this custom mountain house Architect designs in features and organization to meet & exceed their Clients’ needs, wants and dreams. 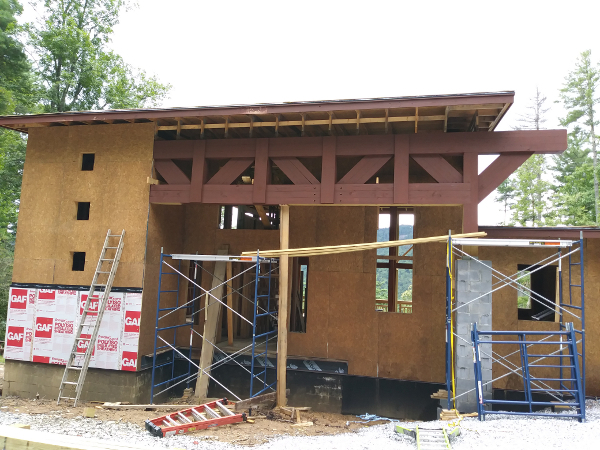 Recently, several people toured an under construction house designed by HOME ARCHITECTS® Senior Staff Architect. All visitors were delighted and amazed by the giant glass/ window areas (the size of a billboard), the spaciousness, the logical planning and placement of everything, the features and openness of the kitchen, pantry, master suite, loft level home office/bedroom and bunkroom, laundry room, outdoor porches, and 2-1/2 car garage. Along with this amazement of the magnificent design features and incredible mountain view, came some sadness. Sad about what? The visitors’ realization that the ready-built builders houses they bought and paid MORE for than this Architect’s house, had much smaller window areas, lower ceilings, cramped kitchens, smaller closets, no laundry rooms, smaller garages (if any), no pantry and overly compartmentalized lack of organization that is unresponsive to views. So when people question the VALUE OF AN ARCHITECT in residential design, THIS is what that is all about. YOU GET A BETTER DESIGN that allows you to live life more fully and enjoyably. Not to mention with greater ease, more functionality and logic, along with lower maintenance. Infiltration (due to bad construction practices). Infestation of bugs, mice, squirrels (due to bad construction and no details or specs). Lousy views, hindered by small windows and cluttered wall areas (due to bad design). Water leaking into crawlspaces and basements (due to bad site design, bad waterproofing (or none) and inferior materials). High maintenance (due to lack of specifications from no Architect during construction). Leaking, high maintenance roofs (mold, rot, wind damage due to inferior products used by builder with no Architect). Bad vehicular circulation, bad vehicular maneuvering (due to no Architect involvement). So: Architect Designs Value into Houses is more than just about cool design concepts and appearance. Good design has to do with designing the house structurally to allow for much larger glass areas to allow the owner to see their terrific mountain views. This requires a Licensed Architect. Good design also has carefully planned spacial organization for functional pedestrian traffic flow through the house. Good design also incorporates materials, practices and systems that result in a more durable house with lower maintenance. Good design requires Value Engineering, to remove things that are costly and unnecessary and replace them with smarter, more effective features that last longer. In a nutshell, good design in your house buys you better organization, a feeling of more spaciousness, lower maintenance and huge mountain views. You don’t get that from buying pre-existing builder houses, or even with new builder houses. They don’t have that capability. That’s why God made Architects and Builders. Architects design, Builders build. Use the strength in each profession to obtain the best possible house for you and your family.